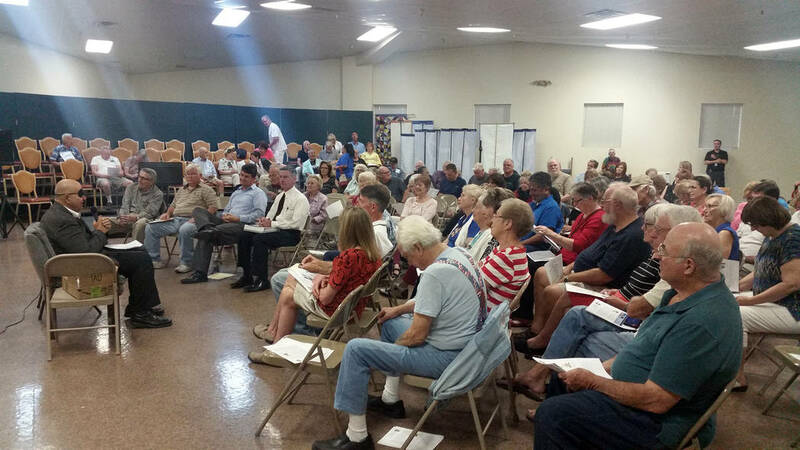 City Councilman Warren Harhay said he thinks the city committed “tactical errors” with the recent utility rate increase, as Boulder City residents expressed their frustration with them at a recent first-of-its-kind town hall meeting. Celia Shortt Goodyear/Boulder City Review City Councilman Warren Harhay leads the first town hall meeting Oct. 19 and shows attendees a device to help them better measure their electricity use. Celia Shortt Goodyear/Boulder City Review Residents fill the Elaine K. Smith Center on Oct. 19 to discuss city utilities at the first town hall meeting, led by City Councilman Warren Harhay. At the Oct. 19 meeting, more than 100 residents filled the Elaine K. Smith Center on Wyoming Street to ask Harhay and city staff, including members of the public works department and the acting city manager, questions about utility rates. 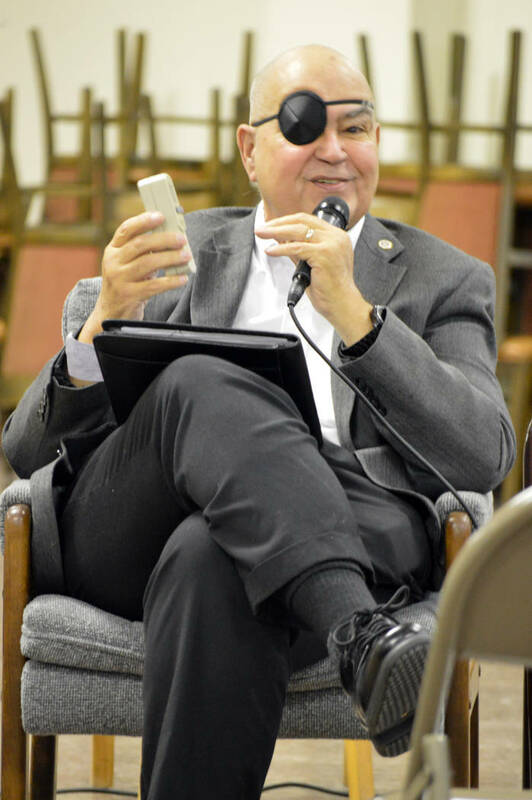 “We’re not going to be able to solve every issue and every problem … ,” Harhay said at the meeting’s start. Harhay said he thought that the city committed a “great tactical error” with the rate increase because it was scheduled for one of the longest billing periods of the year as well as one of the hottest months of the year. During the hourlong meeting, residents asked questions and raised concerns about the accuracy of meter readings, the length of billing cycles, use of the utility funds, new meters and the higher amounts of their utility bills. They also suggested that other financial benefits from the solar fields be found, as well as creating a Boulder City utilities commission. 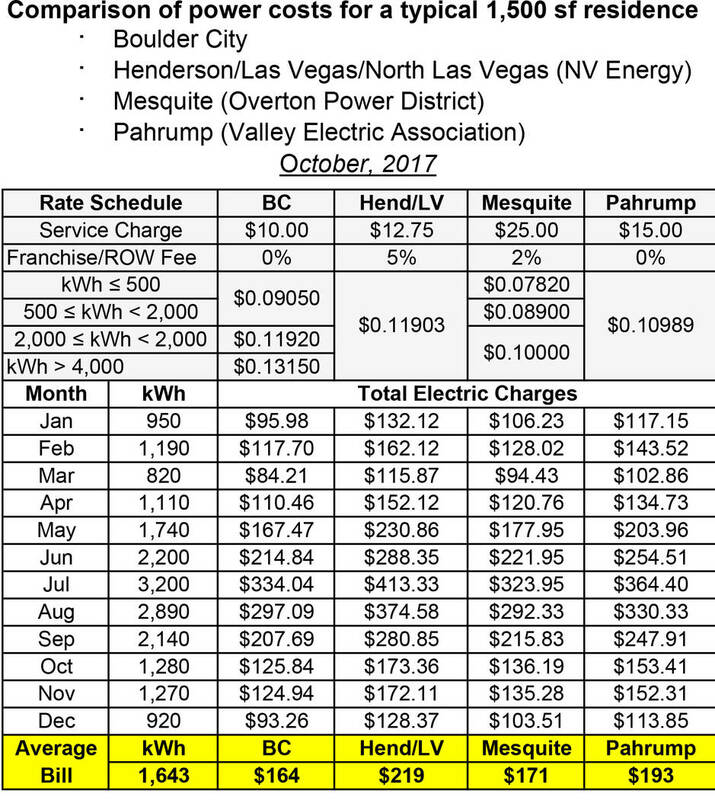 Resident Dominique Pfeiffer was concerned that some billing cycles were for 15 days a month and others were for 35 days, which could bump users into the second and higher tier of pricing during the summer. She asked if they could be more consistent. Harhay said that remedying that issue was “in process” and required a modification to the billing software, which council and staff were researching. “It just isn’t right for people one month to have to pay a tier surcharge and then the next month not just because the city software doesn’t comply with what people are expecting,” he said. Harhay also discussed reasons for higher usage readings, leading to higher bills, and suggested that they could be higher because the meters replaced were old, read low and possibly did not measure usage efficiently anymore because of their age and the harsh environment. The new meters read with a 0.5 percent accuracy, he said. “The city was being slightly shortchanged by the fact that these meters are reading low, so you were getting electricity without paying for it in many cases,” he said. Some residents suggested the city freeze rates for the time being. Linda Barnett suggested the city implement a moratorium on future utility rate increases until an independent investigatory committee is set up and can perform an “honest assessment” of the utility fund. Resident Greg Todd suggested that the rates be frozen until all the new meters are installed to ensure the electricity being measured balances out with what is being charged. “What I want to commit to you is that any of the questions that have a soft or a nonanswer … will be answered … We’ll have more information for you,” Harhay said, adding there was no intention to hide or subvert any information. There were more questions and concerns than the hour allowed, and Harhay is planning a follow-up meeting in November. In the meantime, he has set up a Facebook group, Boulder City Utility User Group, for residents to obtain more information. Additionally, he welcomed further comments and questions through cards passed out at the town hall meeting and by email at wch@eva.net. “The Town Hall was just a start and yes, perhaps a flawed start, but we can do better and I pledge to do just that,” he said.